MINNEAPOLIS (AP) — Minnesota Rep. Keith Ellison said Friday he won’t abandon his campaign for attorney general amid allegations that he once physically abused an ex-girlfriend and said if she claims to have a video of the incident she should produce it. Normally a constant and visible presence on the campaign trail, the Minnesota Democrat had largely disappeared from public view since the allegations first surfaced over the weekend that he quickly denied. 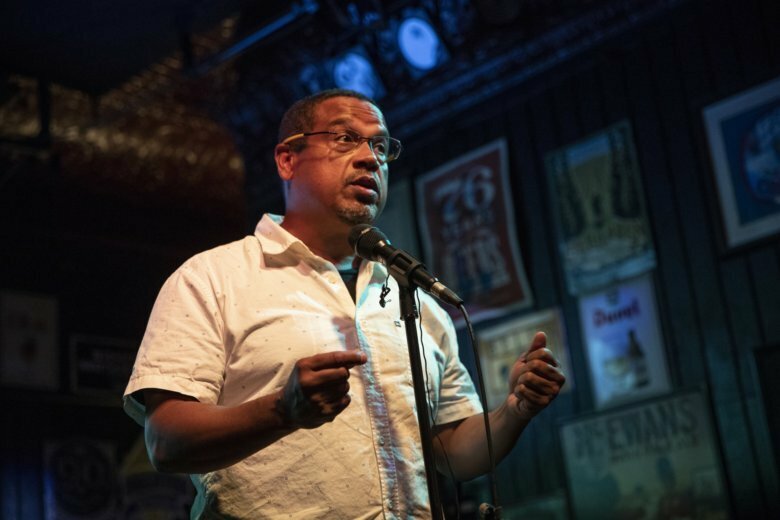 Karen Monahan said Ellison once dragged her off a bed by her feet while screaming obscenities, claiming to have video footage of the 2016 incident. She has declined to provide that footage to The Associated Press. She has told other media outlets she will not release it, saying it is humiliating and that women shouldn’t have to provide backup to be believed. But after easily winning a crowded Democratic primary this week, Ellison re-emerged for a campaign outreach event to knock on doors and talk to voters in north Minneapolis Friday, providing his most expansive comments on the allegations yet. He again denied any physical abuse of Monahan and challenged her to provide the footage. “I’m not the one who claimed to have evidence. And I think the person who said they have something, it’s on them to produce it,” he said. Monahan did not immediately respond to a message seeking comment. Other groups such as the National Organization for Women and women’s rights group Ultraviolet quickly called on Ellison to drop out of the race, but no prominent Democrats have followed suit. In suburban Edina, 75-year-old Democrat Mary Jane Liss called the allegations disappointing but withheld judgment. Ellison asked voters to put their trust in his account of the incident. But he also noted the difficulty of balancing his outright denial against a broader need to trust women when they come forward. Some Minnesota Democrats are still feeling the sting of the resignation of former U.S. Sen. Al Franken, who left office in January after allegations of groping women. Local United Food and Commercial Workers International union president Jennifer Christensen joined to help Ellison in Minneapolis and recoiled at the memory of Franken’s exit, saying it was unfairly forced. “Our most powerful advocates can be so easily destroyed by an accusation,” she said. “We support Keith. We believe him,” she said.